I am a fan girl of techies. Yet it makes no sense at all. From my earliest school days I suffered from math anxiety. I still do. Ms. Walsh, my 2nd grade teacher would write a math problem on the chalkboard, and my throat constricted, my stomach tightened and my eyes got blurry. Things didn’t get much better in junior high and high school. The problems just got harder and more confusing. Even the math tutors my parents hired to help me decipher this foreign language couldn’t do much. 1) TECHIES ARE CREATIVE. Techies use numbers creatively to design robots, create time saving applications and access instantaneous information. And that creativity is closely associated with a wicked sense of humor! 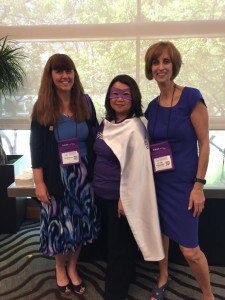 Just take a look at the photo above of Canadian engineers Jennifer Ng Ain Kin of Abbott Point of Care and Janet Davis of ciena, who called attention to the superpower of techie women at the 2015 IEEE Women in Engineering International Leadership Conference in San Jose, CA. 2) TECHIES LOVE WHAT THEY DO. In describing a new process or program I lose myself in their exuberance. It doesn’t matter that I have no idea about the intricacies of the problem they are solving. I just enjoy watching their utter joy in describing it to me. 3) APPRECIATE AND RESPECT “SOFT SKILLS.” Many techies are introverts. In order to sell their ideas, obtain resources and instill innovation they know that people skills are necessary. And they look for ways to apply these tools to get results. Fortunately I don’t have to worry about that next algebra exam any longer but remembering that anxiety is useful. It gives me empathy for introverted techies who detest walking into a social gathering or speaking up at a meeting. Maybe we aren’t that different after all. This entry was posted in introvert on May 18, 2015 by Jennifer Kahnweiler. From one Jennifer to another: thanks so much for posting the picture on your blog here. I had a great time at the WIE ILC and meeting you! I am one of the odd engineers who is NOT an introvert 🙂 but indeed you have captured some of the reasons why we enjoy being engineers. Hope to see you again next year at the 2016 WIE ILC. Au Revoir! Thank you Jennifer! I was so impressed by your great outfit and have the photo to remember! Thank you for your service to women in engineering! I will be speaking at the Summit in Atlanta and hope you can make it down south.